U.S. Army Stops Discharging Immigrant Recruits Seeking Citizenship In recent weeks, dozens of military recruits had their enlistment contracts canceled. They had joined the military as part of a program to recruit foreign nationals with critically needed skills. A Pakistani recruit, 22, who was recently discharged from the U.S. Army, holds an American flag as he poses for a picture. 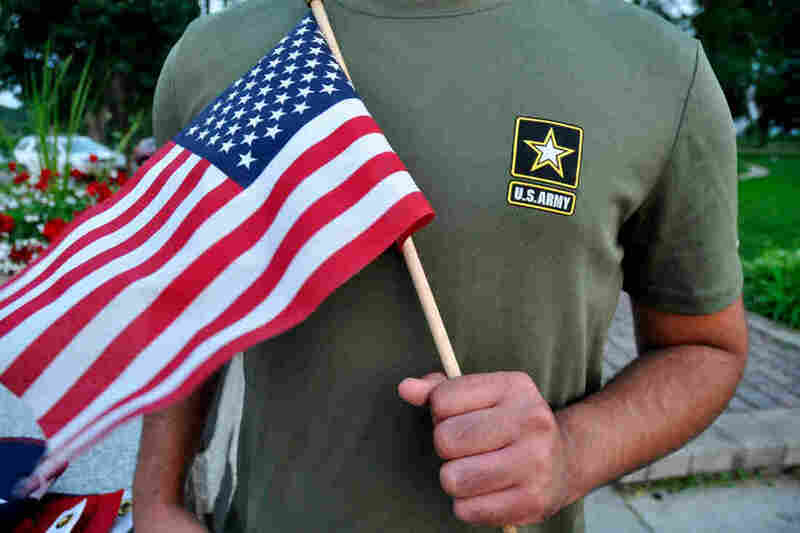 The U.S. Army has stopped discharging immigrant recruits who enlisted seeking a path to citizenship, at least temporarily. "This in no way reflects a change in the Army's compliance with DOD's MAVNI program," said Lt. Col. Nina Hill, an Army spokesperson. "We continue to abide by all requirements to include completing a thorough background investigation on all MAVNI applicants." "[MAVNI] was established in 2009 to create an opportunity for the military to enlist people with specialized knowledge, including highly sought-after language and medical skills. "Those enrolling had to reside in the U.S. legally, such as under student visas, or seek asylum but could not be green card holders. Enlisting gave them a fast-track path to citizenship, sometimes even before beginning basic training." The MAVNI program has been officially suspended since 2016, after the Pentagon said its security protocols should be reviewed. But that has left hundreds of people in limbo — and at risk of seeing their visas run out in addition to having their military contracts canceled. As of April 2018, "roughly 1,100 people who had signed contracts but had not gone off to basic training" were still in the pipeline, Maj. Carla Gleason, a spokeswoman for the Pentagon, told NPR last month. In July, dozens of enlistees were told they weren't eligible to serve in the U.S. military, with officials citing the results of security screenings. But in the case of two recruits who spoke to NPR, those problems seemed to be the existence of any ties outside the U.S.
A reservist who spoke to NPR — and who filed a Freedom of Information Act to discover the reason for his discharge — learned that foreign ties were to blame. His fiancée and his parents live in Pakistan. And despite a reviewer's positive impression of the man and his loyalty to the U.S., he was turned down for service. Another enlistee, Panshu Zhao, signed up after moving from China to the U.S. for school. He is now pursuing a doctorate in geography at Texas A&M University — but after the military rejected him, he told NPR, "This is a whole disaster. This is a total mess — a big mess."